I don’t know about you, but I need a vacation. I need to be laying on a beach someplace warm and tropical, listening to ocean waves crashing on the shore and working on my golden bronze tan with not a care on my mind. I don’t know about you, but that’s not gonna happen for me anytime soon. Let’s face it – I’ve never ever been golden bronze tan in my life. So I decided to take my taste buds on a vacation instead. Did you know it’s pineapple season? Fresh pineapples are available in stores year round but peak growing season is March – July. Which is why I’ve bought and consumed 2 whole fresh pineapples in less than a week. They’re so sweet and delicious I can’t stop myself! Nothing tastes more tropical to me than the combination of pineapple and coconut, like in the classic piña colada drink. Since it’s still on the chilly side here, I opted to go with the slightly warmer option of piña colada cake. 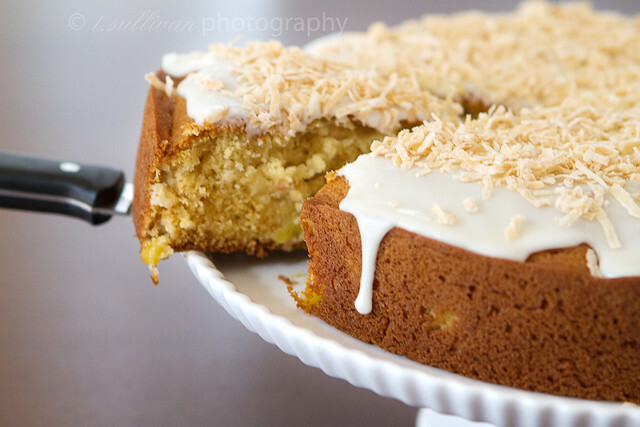 This piña colada cake is a moist, coconut flavored yellow cake with bits of fresh juicy pineapple throughout, all topped with a coconut and pineapple glaze and toasted coconut. It’s a vacation for your tongue. For the few moments it takes you to eat a slice, you’ll feel like you’ve been whisked away to a tropical island. Note: Cream of coconut is NOT the same coconut water or coconut milk. I used Coco Lopez cream of coconut for this recipe. It’s often found where you would buy cocktail mixers or in the ethnic foods aisle. Preheat oven to 350°F. Butter and flour a 9-inch round cake pan, or spray with baking spray. In a medium bowl, whisk together flour, baking powder, baking soda, and salt. In the bowl of an electric mixer, cream butter and sugar with the paddle attachment until light and fluffy. Beat in eggs one at a time, then add rum and vanilla. Add cream of coconut and beat. (Batter may look curdled – it’s OK.) On low speed, add half of the dry ingredients at a time, mixing and scraping down bowl between each addition, until just combined. Fold in fresh pineapple with a spatula. Spread batter (it will be thick) into prepared pan and bake at 350°F for 35-40 minutes, until the center springs back when touched and a toothpick comes out clean. Cool in pan on a wire rack for 10 minutes, then invert cake onto rack and cool to room temperature. Once cool, combine powdered sugar, 1 1/2 tablespoons of pineapple juice, coconut and vanilla extract in a small bowl. Stir until a thick (spreadable but not runny) glaze forms. If too thick, add up to another 1 1/2 tablespoons of pineapple juice. Pour glaze over cake, nudging it to the edges with a spatula. 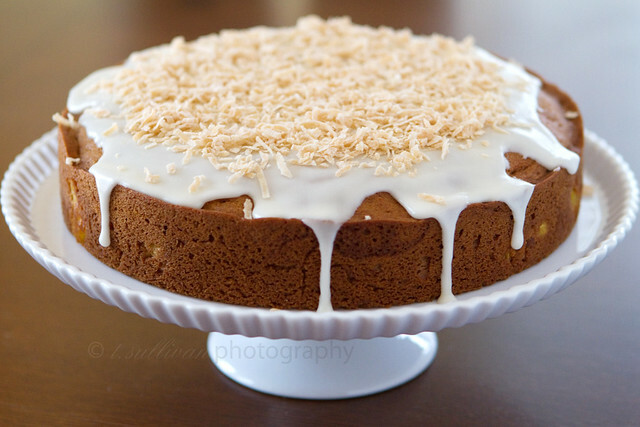 Sprinkle toasted coconut on top. Store tightly covered at room temperature. This looks amazing! I LOVE pineapple and ESPECIALLY LOVE toasted coconut! Yum! Pineapple and coconut…the best tropical pairings ever! Yum! Love this! Your photos are beautiful! After reading your tweets about buying/eating pineapple, I bought one myself when I went grocery shopping–I always forget how much I love pineapple until I eat it again. Oh lord this cake look so moist and delicious! I definitely want a piece right now! If I wanted to make this a double layer cake what frosting would you use? Omg, this is like my dream cake. Must make! I don’t have a cake pan, can you just mail me like half a cake? Thanks, yum! This recipe just looks wonderful. Great photos too.